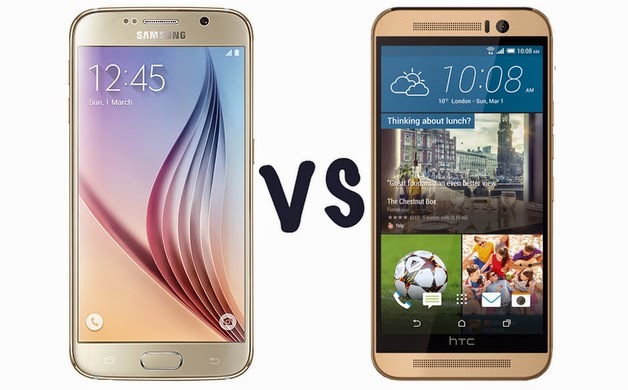 Both Samsung Galaxy S6 and HTC One M9 are the new entrant to the market. Both have high tech specifications. HTC was once ruling the Android market but the mobile manufacturer giant Samsung supplanted. Whether it is Samsung Galaxy S6 or HTC One M9 both phones quality designed and high specification phones. During the buying process it is very important to understand the difference in the two phones. One M9 is thicker than Galaxy S6. The S6 has an Aluminium body and is 6.8 mm thick. It is a mix of glass and metal which is much harder and highly expensive when compared to other S-series. Whereas, One M9 is 9.6 mm thick and also with an Aluminium body. It has got brushed finish on the rear and better ergonomics. The curve of the phone hugs your hand in a comfy way. The S6 has magnificent QHD screen. It comes with a 5.1 inches screen having a resolution 2560 x 1440 super AMOLED. Whereas One M9 has a slightly lower full HD when compared to S6. It comes with a 5.0 inches screen having a resolution 1920 x 1080 super AMOLED. Processor is the brain of mobile. It is very important to watch for the one that matches your need and demand. The galaxy S6 is now using Exynos 7420 of 2.1GHz with a 3GB RAM. They have dropped Qualcomm CPU. The processor Exynos 7420 uses advanced14nm production process when you compared it with Snapdragon 810 which uses 20nm. This helps in power bonus and efficiency. Whereas, One M9 comes with a Snapdragon 810 of 2GHz with a 3GB RAM. Since both phones processors differ there is a slight difference in the processing speed of their processors. Samsung Galaxy S6 or HTC One M9 both phones comes with a 3GB RAM which is very much fast and effective in switching multi applications simultaneously. It helps you to perform multitasking efficiently and effectively. Only the problem with M9 is it just gets slightly warmer than the S6. Samsung is better when comes to camera. It is the USP of Samsung and it focuses on it more as compared to other features. After the processor and RAM, camera is the second thing that people notice during their purchase however may be the need and requirement of some people differ in their priority of going with the camera. Galaxy S6 comes with a 16 MP Rear with f/1.9, and features like OIS and LED flash. It has a 5 MP front camera taking beautiful selfies from any angle. One M9 comes with a 20 MP Rear with f/2.0 and dual LED flash. It has a 4 MP front camera. Camera is very much reliable in Galaxy S6 almost like iPhone, where One M9 subject to overexposure. When in low light or taking picture at night Galaxy S6 is far better than One M9.